People’s Daily has been very consistent in recent Sundays, gleefully excoriating various aspects of Western politics, especially the United States. From social divisions to how and the capitalist system at large is facing a grave crisis, commentators on page 5 of the Sunday edition have been blasting away at what they see as the failings of American and European polities. 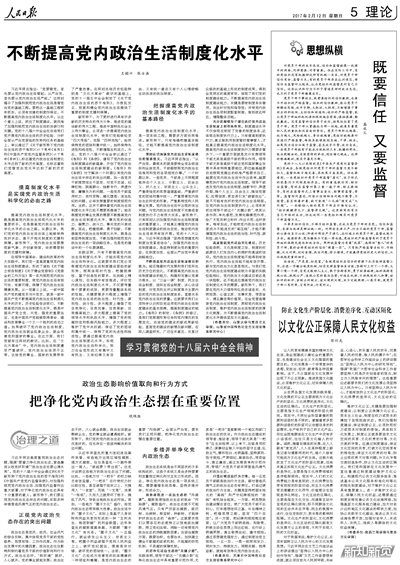 Except this past Sunday, when the entire page was devoted to the problems in managing the Chinese Communist party. The essays that appear aren’t especially path-breaking, focusing on the ways in which the Party needs to govern itself better than it has been. While that’s not a new concern, for a Sunday edition of the Party’s flagship newspaper, it’s a notable shift away from its recent assault on institutions outside China’s borders. It’s possible that the word went out to go easy on Washington’s troubles, because the phone call that transpired between Presidents Xi and Trump went well. It’s common for People’s Daily to have two or more sets of essays ready to run on the weekend (particularly on a Sunday, per at least one source) in the event that something or another happens (or doesn’t). Maybe that’s what occurred this time around. 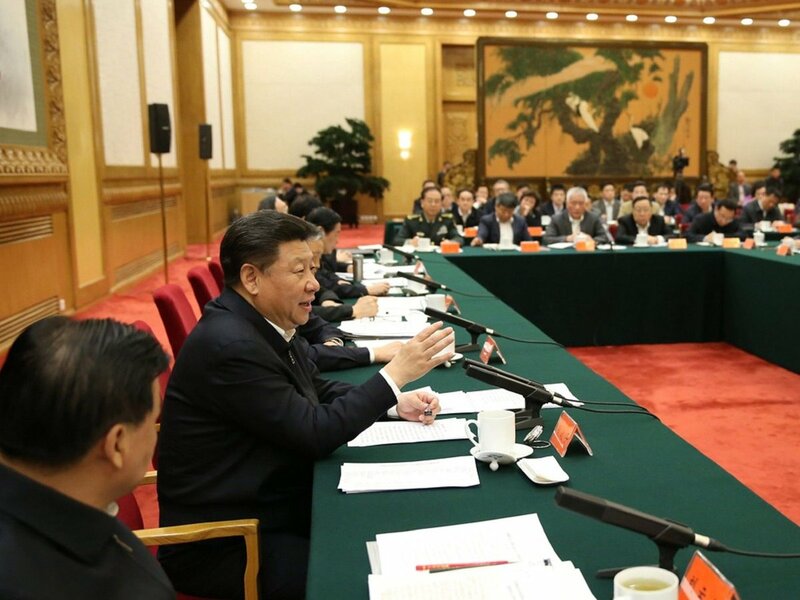 And if that’s the case, it indicates that Xi’s effort to get People’s Daily to be more pliable to his particular political line, instead of reflecting the consensus of the leadership as a whole, may be finally taking firm hold. But there’s at least one other explanation: That this shift appeared because Xi and his allies are increasingly anxious that their efforts to get cadres to conduct themselves properly are still falling far short. The result is, the author notes, “a reality which is not uncommon”, when either cadres are too cautious or they “risk derailing the train, or act like wild mustangs, as they behave in a self-destructive manner, and trample discipline” [一些党员干部就有可能成为脱轨的火车、脱缰的野马，做出践踏法纪、自毁前程的举动]. None of that sounds very good. If Party officials aren’t paying attention to rules and regulations, they’ll create their own local fiefdoms and corruption will continue. If cadres are too timid to engage in needed reforms, governance and public policy will suffer—and so will Xi and those associated with him and his agenda. That continues to be the major test for Xi—not a citizenry eager to exercise rights that don’t actually exist, but cadres whose attitudes and actions still aren’t quite aligning with Beijing’s. Putting that problem on the pages of People’s Daily in a place that had been devoted to other matters is another signal that it’s the challenge that trumps everything else. Or it could be the usual government-as-Tiger-Mother exaggeration of problems. After all, the Chinese government's performance is akin to bringing home a straight A report card with a B in violin. With the possible exception of the world's other two democracies*, Singapore and Switzerland, all national governments would be thrilled to have the policy support and trust level that China's does. * 'Democracy' being government of the people by the people and for the people. Thank you, and my apologies for not replying until now. I agree with your view, and continue to be struck by the narrative that China is unstable; the economy is about to implode; the society is seething. On the ground here, matters are, as you note, rather different that portrayed by all too many.